As harsh winter weather hits the nation, roadways become especially dangerous and, in an instant, the usual commute can become a life-threatening nightmare. One woman in Indianapolis experienced this danger firsthand, and it's her prayer to God and her perfect execution of emergency crash protocol, and the Indianapolis Fire Department, that saved her life that night. Snyder’s car was one of two that hit a patch of black ice and slid off the road into a frigid pond on Monday night. As if slipping off the road isn't terrifying enough, Snyder then experienced the next terrifying step that sends most crash victims into panic: The car began filling with water, and Snyder was filled with indescribable fear. On that dark, freezing night, Snyder didn't know if anyone had seen her go off the road. She had no idea if help was coming, or if she was going to drown in her car. "I just started praying and calling out to God." Snyder said she was listening to a radio program about angels when, surely not by coincidence, she found herself in desperate need of one. 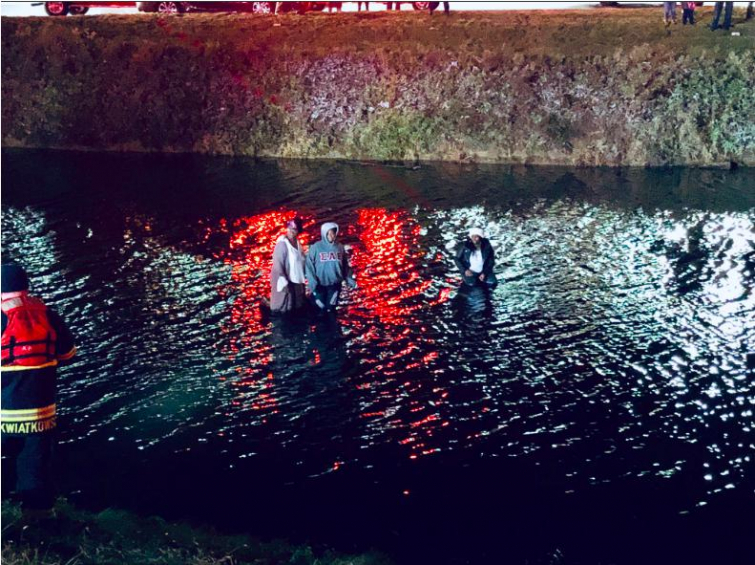 It's then that Snyder, suddenly filled with God's peace and guidance, did exactly what Indiana State Police and other nationwide authorities say to do in the event that you find yourself trapped in your vehicle in water: open the window to escape. While Indiana troopers say you don’t need to swim and can simply climb atop the vehicle's roof until you are rescued, Snyder swam to the banks of the pond. Thankfully, Snyder and the others in Monday's accidents became a cautionary tale rather than an obituary. Their actions and the impeccable response of the Indianapolise Fire Department can serve as a lifesaving example to all of us as ice-coated highways increase with the rapidly approaching winter. Not long ago, four Indiana state troopers demonstrated for citizens how to escape through a sinking car’s windows in just moments and then stay on top of the car and out of the frigid water to await rescue. This lifesaving technique clearly worked for Snyder and the others. “If you sit here and call 911, you drown in your car,” said one trooper involved in the demonstration. Instead, police urge motorists to remember these simple steps: seatbelt, windows, children, out. Unbuckle seatbelts, open windows, and kids and adults escape out the window and onto the roof of the car. If kids are in the car, the oldest and strongest should be helped out of the vehicle and onto the roof first, where they can help hold onto younger children, including babies, before adults can finally begin exiting the vehicle.